The plan for approval will be tabled in coming federal cabinet’s economic coordination committee (ECC) meeting. Minister for Petroleum and Natural Resources Shahid Khaqqan Abbasi on Tuesday in an in-camera briefing said the government was mulling over an alternative plan to IP gas pipeline project. A substitute plan for the supply of gas will be presented before the ECC, the minister said. If an alternative gas supply is not arranged then Compressed Natural Gas (CNG) stations and the industries during winters will not find continuous supply of gas, Abbasi observed. As a Result The price for gas would be revised upward , and the Burden of it would be definitely borne by the ordinary citizen , which is already under Heavy Debts , due to ever decreasing Economic Activities of the Country . He told Parliament would be approached in case Supreme Court (SC) of Pakistan would reject the appeal filed for charging the gas consumers on account of Gas Infrastructure Development Cess (GIDC). At present, court has stopped collection of GIDC and we have approached apex court against the order of the court, He said. A bill would be tabled in the Parliament if SC did not give relief. He said around Rs 84 billion has so far been collected under GIDC from the consumers. Responding to a question, he said price of Liquefied Petroleum Gas (LPG) was being regulated and the ECC would also be approached for regulating the price of LPG. He claimed prices of petroleum products (POL) have been reduced about 1.5% from Today . However, consumers will not get the Maximum relief in next month’s POL prices due to depreciation in the value of Pak rupees against dollar. Abbasi informed about issuance of an ordinance to collect GIDC from CNG and industrial sector. Officials at Petroleum Ministry said GIDC would be added in the gas price for said sectors. They said price of CNG in region-I would find Rs 15.07 per kilogramme (kg) and Rs 13.77 per kg in region-II, while Rs 200 million cubic feet per day (mmcfd) surcharge would be levied after the imposition of GIDC on CNG and industrial, fertilizer and powers sectors. Pakistan and Iran finalised $7.5 billion gas project dubbed as a peace pipeline to start supply of natural gas to the former from 2014. Under the gas sale and purchase agreement (GSPA), Pakistan was expected to import about 750 mmcfd with a provision to increase it to one billion cubic feet a day (bcfd). The volume of imported gas was also expected to be about 20 percent of Pakistan’s current gas production and the agreement was for a period of 25 years and renewable for another five years. This Project which was very vital for the Economic Growth of Pakistan , and was a Major Project which can directly lessen the Problems of the Energy starved Pakistan , and can not only Kick up the dwindling Economy of Pakistan , but at the same would have given direct benefits to the common citizens of Pakistan. 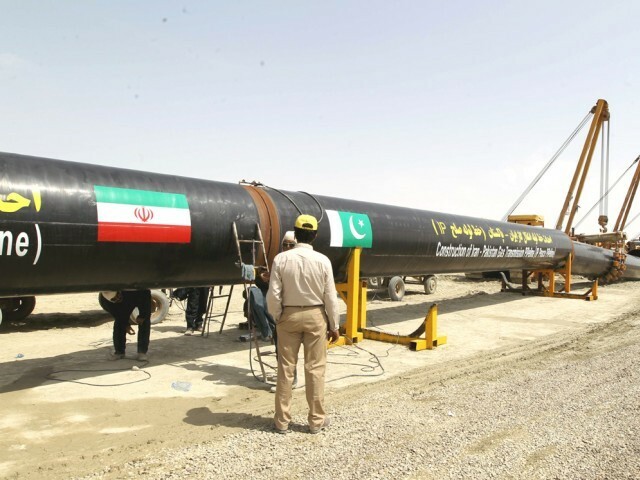 While at the same time the Irani Govt Has already completed Construction of the Required Pipeline from its Gas field to the Pakistani Border to connect with the Pakistani Side Pipeline , which has not been done till yet , due to the lack of Interest of the Nawaz Govt. The PML – N Government Led By Nawaz Shariff which has come into Power due to the support of Saudi Arabia and US , has been critical of this IP Gas Project since coming into Power ,due to the pressure from both its sponsors US and Saudi Monarchy . And at the same time Pakistan which is fighting a War against the terrorism and sectarianism is being sponsored by the same Saudi and US Governments. This entry was posted in Asia Pacific, Iran News, Pakistan News and tagged CNG, Compressed Natural Gas, gas pipeline project, GIDC, IP Gas Pipeline, Iran - Pakistan Gas Pipeline, Natural Resources Shahid Khaqqan Abbasi. Bookmark the permalink.